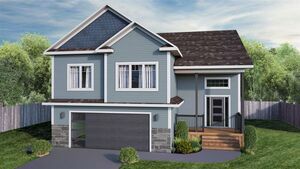 30 Chera Drive, St Margaret's Bay (MLS® 201901853): Build this finely crafted new home design which will feature exceptional styling and wonderful curb appeal. Bay Village is a wonderful boutique neighbourhood and located only three minutes from all amenities. The school zone is amazing! Features of this new home & floor design will include certified energy star build, tech ready pkg, upgraded trims and finishes. Site lines extend from room to room and are wonderfully detailed. Upper level features 2 secondary bedrooms with a hallway full bath, laundry room and of course a deluxe master-suite with walk in and en-suite. Start fresh and buy new! Peace of mind for years to come. Advanced materials, new technology, 8 year warranty, more secure and worry free. Smart home features are available. Lot could possibly accommodate a detached garage at an extra charge. ONLY 2 lots left to build on in the Bay Village!